PUC Bhd is an investment holding company. The company has aggregated its operations into three reportable segments, Advertising and Media segment; Biometrics and Renewable Energy segment; and Financial Services segment. Biometrics and Renewable Energy segment provides fingerprint verification products, information technology solutions and involved in other renewable energy projects. Advertising and Media Segment engages in advertising and media brokerage and consultancy; Financial Services segment is engaged in the provision of financial planning and advisory services, and agency of insurance. Advertising and Media segment is the major revenue contributor to the company. king36 PUC no hope. 0.095 max? freddiehero wah wah... ready liao? cybergreen tew will tell u buy at this level. becareful of tew. cybergreen thanks Tew. At least now you are telling the truth. cytew Buy more PUC if acquisition of remaining 67% of Pictureworks is successful..But to carry out this ,PUC needs an immediate cash of about 25 million, and a total about 120 million cash is needed..Therefore fund raising through private placement or right issue or both is essential..
Daily8 cytew, what will be the impact from private placement or right issue? The spread of shares is so huge at the moment. Price will gets lower and lower. Don't forget PP has been done last year. Daily8 Earning from Puc still far fetched. freddiehero y tis need right issue? Daily8 I doubt there will be any rights anymore. cytew Daily8, did you read through the two PIctureworks acquisitions , namely 33% acquisition during 2018,and current 67% acquisition..And also their payment methods and schedule ? In addition to that , please read through its current balance sheet.. Where can PUC get cash 120+ million cash for the acquisitions ? ming Good stock also will down ; lousy stock also will up lo.. 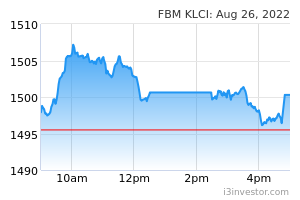 But it is very hard to find a share didnt rebound at all after big wash last year.. puc really win liao..
Daily8 cytew, your meaning is they will still do RI , right? I don't understand why Pictureworks is part of their plan , as I know the revenue contributions isn't very lucrative. Daily8 cytew, please enlighten the part whereby u forsee there will be more rights coming in. 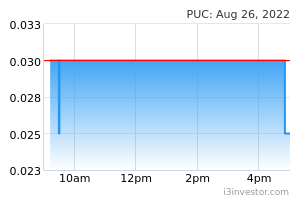 How long investment are u looking at PUC? Long term perhaps? Daily8 If rights is more suitable, what happened then the price of PUC? Gets lower than current 9.5 cents? Daily8 it's ok sitia, cytew share with us, and been on PUC for quite sometime. I trust him. yongch Right issue around the corner...careful all yr hard earn money!!!tp0.03-0.05!!! reiwa Good morning ladies and gentlemen. Does the conversion of ICULS and warrants generates proceeds to the company? If so, a run through of the announcements by the company from period of 1-Jan-2019 to 31-Mac-2019, there would be roughly RM 23 million proceeds from the conversion. The proposed acquisition of PW, there are settlement in cash and shares of PUC to the sellers (CCC, SGSB, BW) in 3 tranches. The above information is not a recommendation for buy or sell. cytew We had suggested to the management , if fund raising is through right issue, please propose right issue of ICPS (PA) with attached free warrants instead of ordinary share, and mode of conversion of PA to mother share must come with " cash option" so only PA is ATTRACTIVE to shareholders because it will behave like a " non-burnt" warrant with leveraging power. Amukutty Cytew u mean to say there is going to be some form of money raising. cytew Without fund raising, how to acquire the remaining 67% of Pictureworks ? reiwa For now, RM 9 million cash required to complete acquisition of PW. Remaining RM 34.9 million cash payable in 2020, and RM 39.4 million cash payable in 2021 as per Tranche settlements listed in above comments. reiwa cytew, thanks for pointing out the cash payment for 33% acquisition for PW. Can advise on the calculation for conversion of La and WB? Should I forward this proposal personally and directly to the boss ? reiwa Good Saturday morning to everyone! Here today to share about the progress on the partnership with Revenue Monster on the leasing of payment terminals for WeChat Pay. There are close to 200 Petron stations with WeChat Pay enabled. For Starbucks, there are over 300 stores in Malaysia. For comparison, there are also other payment terminal used for accepting Boost, like the one used in 99 Speedmart. This payment terminal in orange is by Sunmi. Veron_teo why I need use wechat pay if I can pay with credit card? each of the Products, whichever is higher. Based on the above, we infer that the 2,000 units of payment terminal are being deployed majority in Petron, Starbucks, and KK Supermart. reiwa Veron, you are right, there are also credit card with paywave feature that we find very convenient. Unless WeChat Pay offers promotion like cash back, there are unlikely mass adoption of the service. The current e-wallet that is widely used in Malaysia is no doubt Boost as it offers cash back for almost every transaction we make. reiwa cytew, can advice on the "Proceeds from disposals of investment in financial assets" of RM 40.586 million ? What does it mean "investment in financial assets" ? reiwa More photos of the red payment terminal. ramada You guys happy-happy buy, the director happy-happy sell. Win-win situation.